This healthy and hearty dish is full of fresh flavours and just a hint of heat. Feel free to play with the sauce by adding different herbs and adjusting the heat. Grilled shrimp would make an excellent substitution for the grilled squid. Enjoy! 1. In a large bowl, whisk together ingredients for the Chermoula Sauce. 2. Add the red peppers and chickpeas to the sauce. Toss to coat. 3. Score the squid bodies and dry them with paper towels. 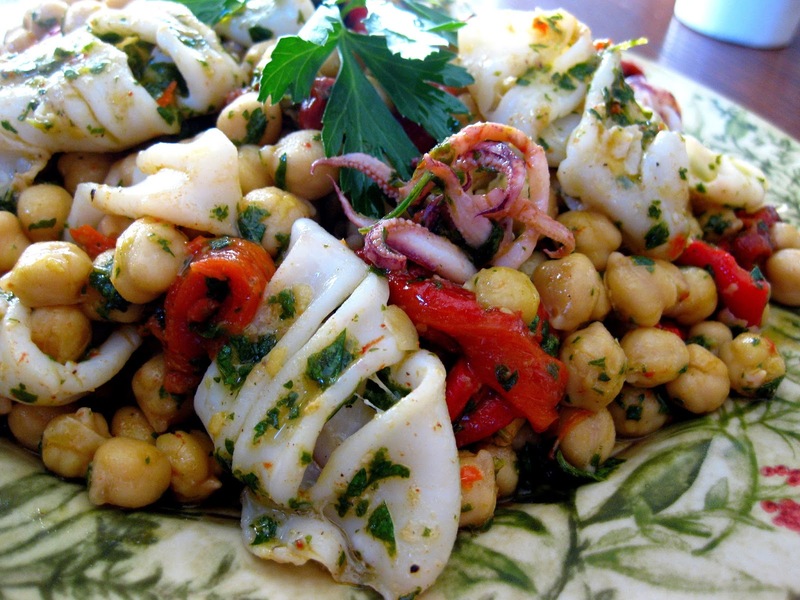 Brush the squid bodies and tentacles with a little olive oil and season with salt and pepper to taste. 4. Heat a grill pan over medium high heat for 1 minute to get it very hot. Add the squid and grill for approximately 25-30 seconds on each side. 5. 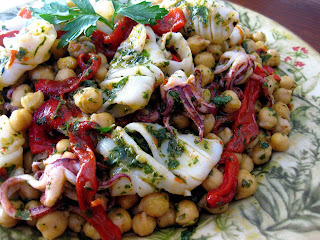 Add the squid to the red peppers and chickpeas. Toss to combine. Serve warm or at room temperature. Amazing - looks really inviting. I wish I was having this for dinner instead of leftovers.